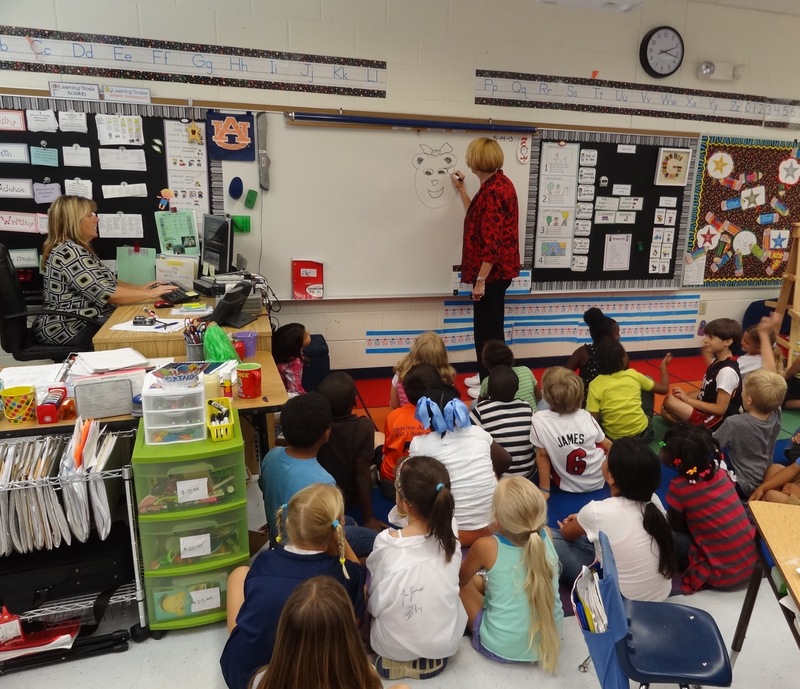 Education Director Callie Spilane presented to Ms. Robyn Gibson’s and Mrs. Jennifer Jordan’s first grade classes at Lake Park Elementary on Thursday, May 23 on how art all comes down to math, as she showed them how shapes form the basis of any drawing. The class had chosen the Naples Art Association for its “Charity for Change” project. The Naples Art Association is pleased to be a Charity for Change recipient. Charity for Change is a nonprofit organization founded in 2008. It creates and promotes opportunities for charitable giving as a way of living through character education and community engagement. They aim to provide a foundation for academic achievement, anti-bullying, volunteerism, community involvement, and social and personal responsibility. Their School “Giver” Program engages 3,500 students, bringing character education to life. Together, each class chooses its charities and sets a fundraising goal. The students bring in change or host mini-fundraisers to contribute to the classroom bank for their charity. Recipient Charities participate by visiting the classrooms and talking about the services they provide to the community, further helping students connect with how their donations help others. On Thursday, May 23, Education Director Callie Spilane made a presentation the first graders on how art relates to math, as she demonstrated to them how shapes form the basis of any drawing. ARTScool programming helps students apply their artistic creativity to subjects like math, science, and history enforcing how art is part of our day to day life. Spilane helped the first grader see how their donations would make a difference to others. Students in Ms. Gibson’s and Mrs. Jordan’s first grade Lake Park Elementary classes collected and donated their change and much needed supplies for ARTScool programs offered at the von Liebig art center this summer. 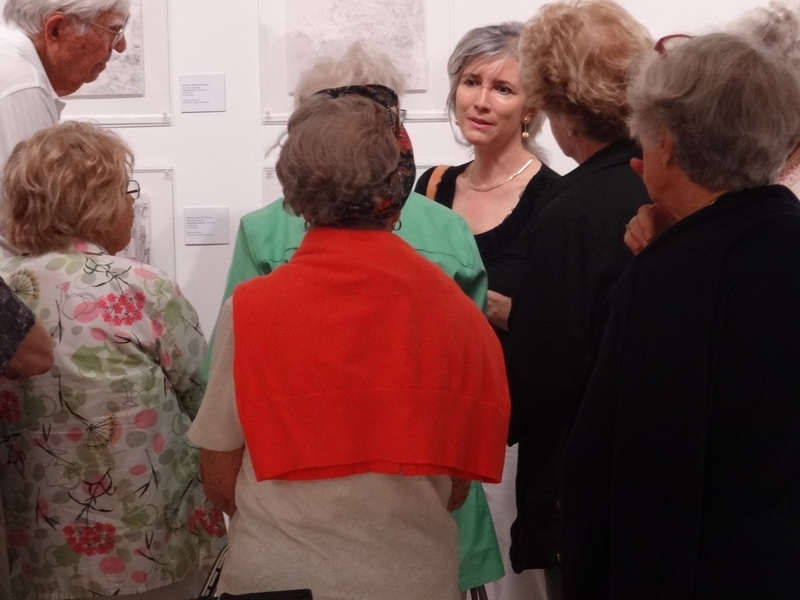 Learn more about educational programming with the Naples Art Association. Learn more about Charity for Change. 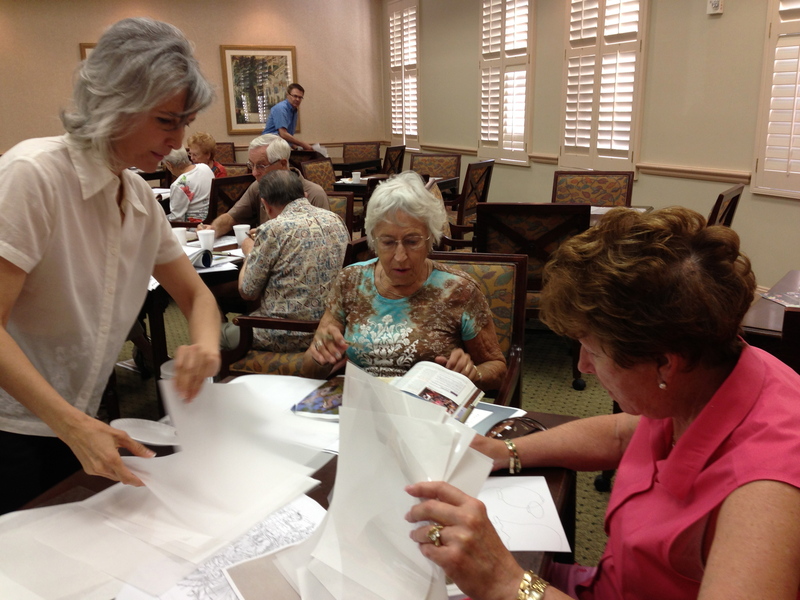 Rebeca Calderón Pittman shows Vi at Bentley Village residents her work on view at the von Liebig Art Center. She had taught a workshop with them earlier in the day. As part of its exhibition La Casa: Latin American Art, the Naples Art Association presents Recombinant Drawings by Rebeca Calderón Pittman. 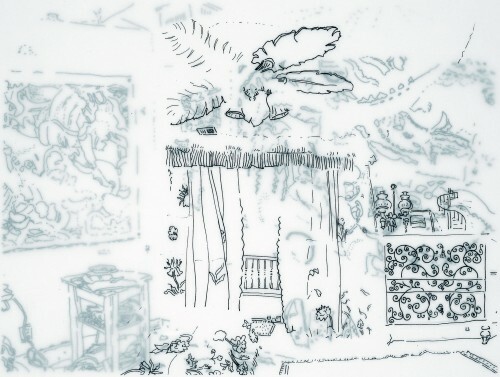 The artist’s work from her Recombinant Drawings, a series she created from 2011-2012, captures the world around her in finely detailed drawings in ink on multiple layers of clear acetate and vellum. The drawings combine a highly focused observation of many different settings including the artist’s studio, buildings, and nature. Fragments of different scenes are layered together to create surprising impressions of the world and the artist’s inner life. Calderón Pittman’s complex drawings are personal and engaging, dreamlike and poetic. Her 15 works are on view at the von Liebig Art Center through June 1, 2013. Gallery hours are Monday through Saturday 10 a.m. – 4 p.m. Embracing Change, with its open window flanked by a heavy curtain, an ornamental grill, and the artist’s painting in the distance, reads as an homage to Matisse, one of the artists that Calderón Pittman has cited as especially important to her. Even more examples of Calderón Pittman’s work as well as other artists in the exhibition can be seen at this link. Rebeca Calderón Pittman studied fine art at Anderson University, based in Cincinnati. She was born and raised in Guatemala where her parents were missionaries. Calderón Pittman sees her calling as an artist in the same light as her parents’ spiritual commitment. Rebeca Calderón Pittman teaching a workshop for Vi at Bentley Village residents. Calderón Pittman has exhibited her work extensively in Guatemala, France, Japan, Chile, Mexico, Nicaragua, and the United States. Her solo exhibitions include the Pendleton Art Gallery, Newport, KY; The Bridge (sponsored by the Cincinnati Art Museum), Mason, OH; and Banco de Guatemala Art Gallery. Her group exhibitions include Pop Revolution Gallery, Cincinnati; CINCINNATI ART MUSEUM; “Expo1” Japan, Tokyo; and “Mujeres por El Arte”, organized by the O.A.S, Washington, D.C., which traveled to The University of California, Santa Cruz and the Museum of Modern Art, Guatemala. The artist’s work is in many public and corporate collections including The Cincinnati ART Museum, Anderson University, PNC Bank, Universidad Francisco Marroquin, Banco G&T, BANCO DE GUATEMALA and Ingenio El Pilar. The Naples Art Association presents La Casa: Latin American Art, an exhibition, celebrating the home and highlighting drawings, fiber work, mixed media, paintings, prints, repousse, retablos and sculpture by twenty-two artists from Latin America, including five Naples artists.The La Casa exhibition will be on view from April 27th through June 1st, at the von Liebig Art Center in Downtown Naples, just one block south of Fifth Avenue South. The Art Center is located at 585 Park Street, Naples, FL, 34102 and the hours are Monday – Saturday from 10 a.m. to 4 p.m. and admission is free. Please call 239-262-6517 if you have any questions. Review more of Rebeca Calderón Pittman’s work on the Naples Art Association website. 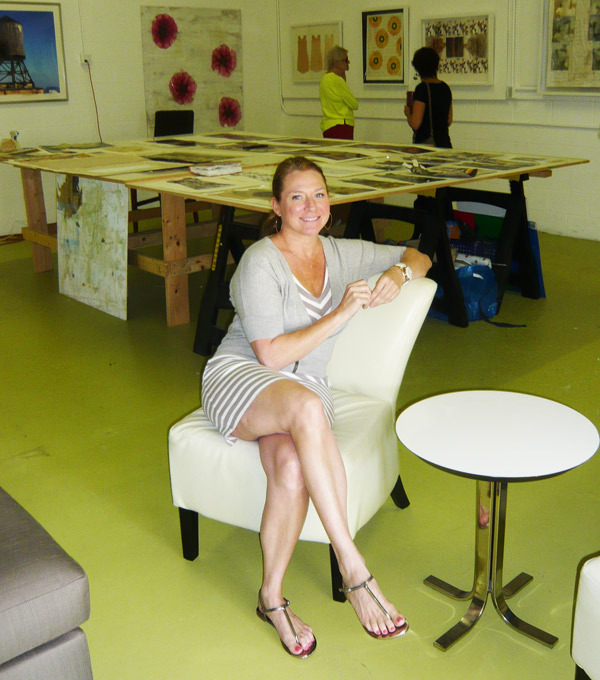 Kelly Hollingsworth in her Naples art studio. Meet Kelly Hollingsworth. Her artwork will soon be added to the Naples Art Association’s collection. A dynamic artist and sought-after art teacher, Hollingsworth lives in Naples full-time and has for more than a decade. When she talks about her work, she lights up. “I am a constructionist. In my process, I collect objects, imagery and emotions. Some of my images have a familiar feel using important iconography, paying homage to my predecessors in art history,” Hollingsworth said. 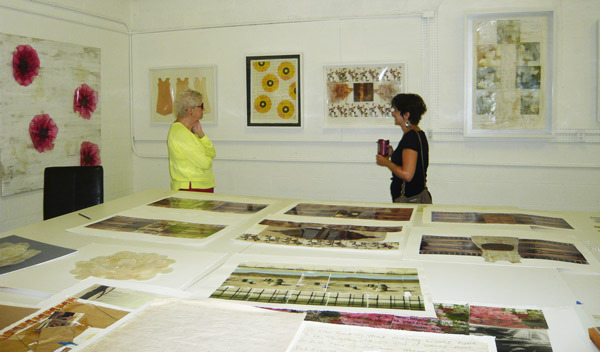 The NAA Collection Committee visited her Naples’ studio to ask her about donating to the 60-year-old nonprofit’s holdings, which include art created after 1950 by artists who have lived in or had a connection to Florida. Hollingsworth heartily agreed. 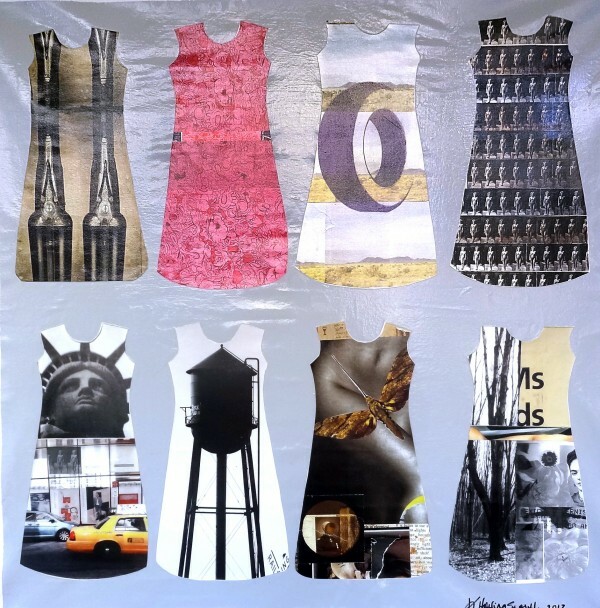 Her piece, which will be completed soon, is a mixed media assemblage featuring her distinctive dress motif assembled with photographic images and a selection of her journal writings. Personal elements like this help Hollingsworth identify with her images, as they collectively serve as a representation of her ideas and emotions over the years. “I try to make the invisible visible and use parts of the self that would be viewed as distasteful into something beautiful. My work is a combination of visually provocative, still images, almost like a film clip,” said Hollingsworth. 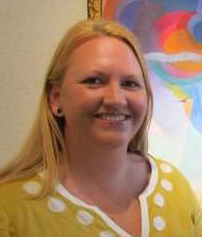 Hollingsworth is a graduate of the Columbus College of Art and Design in Ohio and she has played an important role in the Naples Art Association’s education program over the years. She teaches two ARTScool classes this summer, Open Studio and Advanced Pop Art. Coming this fall, she is beginning a new class with the Naples Art Association geared toward helping high school aged artists develop and organize their portfolio in preparation for growing their future creative careers. Like us and stay in touch with the Naples Art Association on Facebook. By Kristine Meek, assistant director of the Harmon Meek Gallery and juror of the Naples Art Association exhibition, Words, Signs and Symbols. Art at its very basic, unifying foundation is a visual conveyance of a story or message. Words, signs and symbols are the tools mankind has used to visually tell our story for millennia. But the meaning of words, signs, and symbols is determined by the viewer and as the viewer changes over time and varies over cultures, the meaning can change. This Naples Art Association member exhibition contains a fine collection of works in a variety of media, all containing some combination of words, symbols and signs. I love how under a single theme there can be so much variety and so many stories told visually through the talents of the Naples Art Association members. I look forward to touring the exhibition with others to observe how other people interpret the story or message of each work. Everyone who looks at these works on the walls and in the corridors and lobby will view and interpret the piece based on what the signs, words and symbols mean to each person. From cave drawings to Jim Dine – yes, I’m comparing the pop artist to Neanderthals – whether it’s a big red heart or a big hairy bison, symbols are used in art to convey a message to the viewer. Symbols help to visually tell a story. 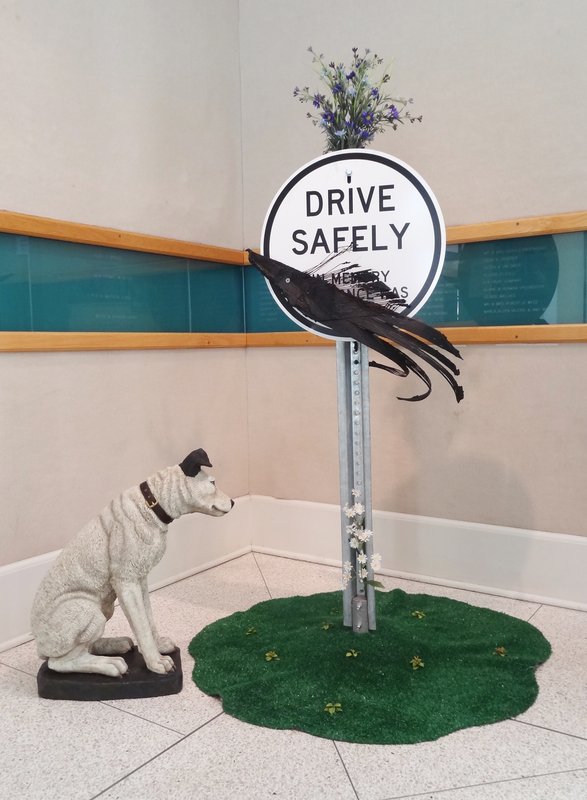 The work I selected for Best in Show (which I have to laugh at myself for picking a work that contained a dog to win such a title), “Roadkill” is an example of symbols conveying a story. To me, the dog was a symbol of loyalty; the piece of black tire, a symbol of death; and the green grass, a symbol of healing. When thinking of symbols in art, religious art comes to mind. I think of the medieval cathedrals’ stained glass windows that could tell Bible stories to illiterate congregations. Many of the works in this exhibition contain religious symbols. 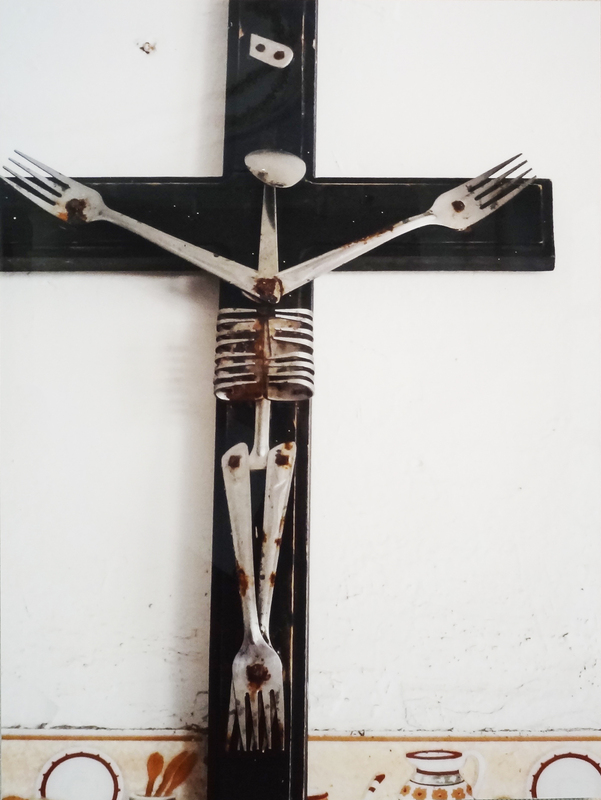 The work, “Eat, Pray, Love” that received one of the juror’s awards was a photograph depiction of a cross found in a kitchen in a small restaurant in Mexico. The cross is a long standing religious symbol revered by over half the world’s population. In this crucifix common kitchen utensils have been nailed to the cross – the rust is a symbol of blood; the forks are symbols of hunger. The photograph received the award, not just for the subject of the cross but also for the interesting composition – slightly off center and cropped to include a bit of the kitchen’s cliché wallpaper, with two of the edges extending beyond the composition. Portraits from earlier eras in this country and in Europe used symbols to tell the viewer about the sitter – a book symbolizing that the subject was educated; objects in the background, foreground and on the figure were hints to the sitter’s occupation, temperament, and achievements. While not a portrait, but to me reminiscent of one, “Bad Advice” made me stop and smile as I walked the room selecting works for this show. Even from across the room, “Bad Advice” made me chuckle. 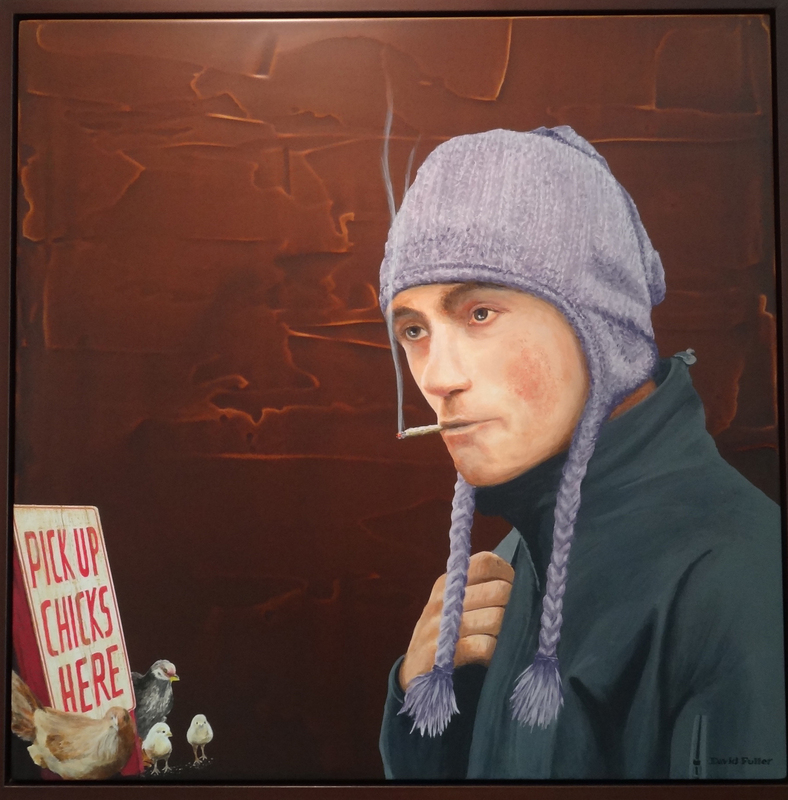 Thinking about the elements of the work: the purple knit beanie, the glazed eyes, the marijuana cigarette, the sign and ironic poultry; I image this man’s story. When I think of words in art I think of Dada artists like Hannah Hoch and of Robert Indiana’s “Love.” Words and letters can be manipulated graphically to show an old message in a new way. The work “Hortus Meus” that I gave one of the juror’s awards to was, to me, an interesting manipulation of an old idea. 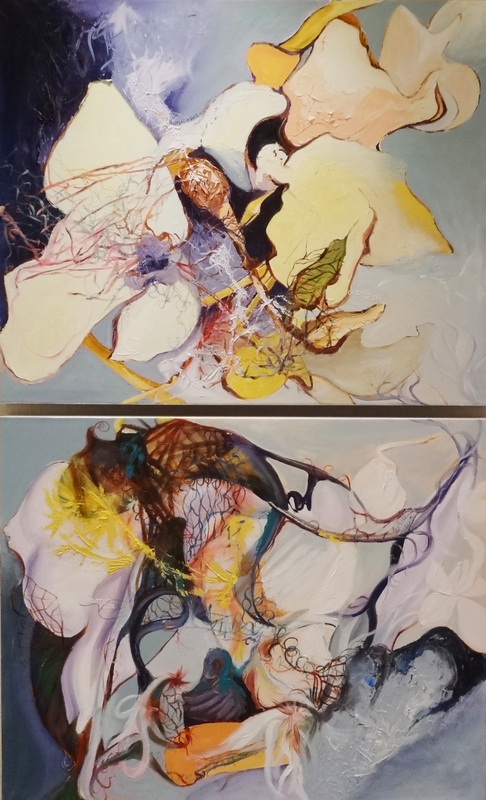 In these two paintings of orchid species the artist has included the Latin name for the plant, just like in an illustration by J.J. Audubon or an 18th century print, but this work is done with contemporary sensibilities and a contemporary font for the Latin text. The final part of the trifecta that is the theme of this exhibition is Signs. Signs in art are often subject matter in Pop Art, Neo-dadaism, and contemporary art made of found materials. 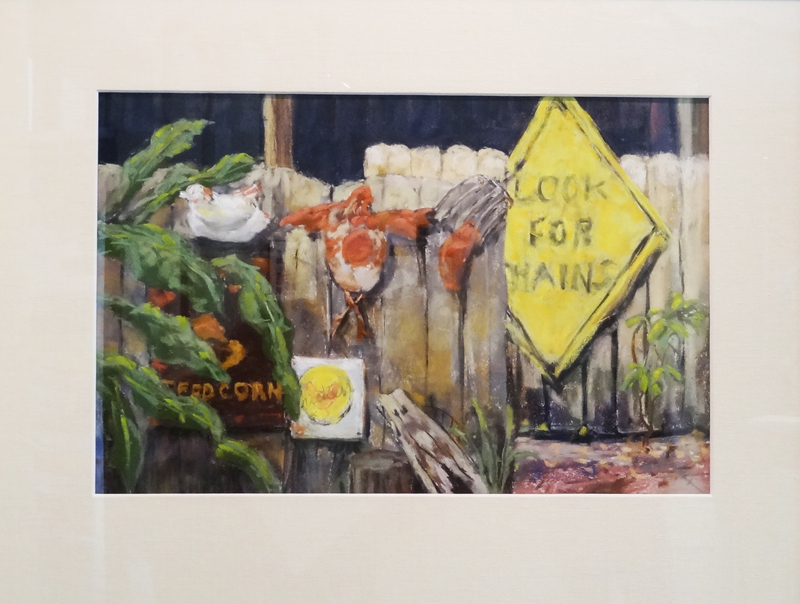 “Chicken Feed” done in pastel has a more traditional, realism perspective and I appreciated that the theme of signs in art was represented not as Pop or modernism, but in pastel with a traditional sense of perspective and realist quality. I wavered on including the purely abstract works but then thought about color as a symbol, so included those works in the exhibition. The works I excluded were ones I personally found less stimulating – their meaning and story were too obvious to me and they didn’t get me to want to explore more. I did include all the 3-dimensional works because I found them to be interesting for their variety of media and I enjoyed the clever use of materials some artists used for executing their concept. This group exhibition contains everything from digital photography to pottery, from collage to colored pencil, from encaustic to natural materials, and oil, watercolor, acrylic, pastel, and pen. Styles of work vary from realism to abstract, conceptual to concrete, and from humorous to mournful. The messages and stories told through these works include encouragement, irony, religious beliefs, ancestral and cultural heritage, new experiences, new points of view, happiness in unlikely places, discord, and commentary on society, just to name a few. The works that resonated and had meaning to me, may not to you, or may not in the same way, and that’s what makes this show so challenging and so wonderful. The Naples Art Association exhibition, “Words, Signs and Symbols” is on view through June 1, 2013 at The von Liebig Art Center in Naples. Admission is free, but donations are accepted to support the nonprofit services and programming of the Naples Art Association. April brought more than showers to Naples! Starting the month off was a reception for the season’s final Naples Art Association Members Gallery 2D/3D show. Art in the Park wrapped another fabulous season, a two new exhibitions moved in, several organizations held gatherings at the art center, One of our exhibiting artists held a special workshop for one of our sponsors, Vi at Bentely Village and more. Check out the gallery of April images by clicking through the photos below. Leave us your comments on your favorite photo!